“Access to Scientific Information Resources in Agriculture for Low-Income Countries” Online Course is now open for Registration! 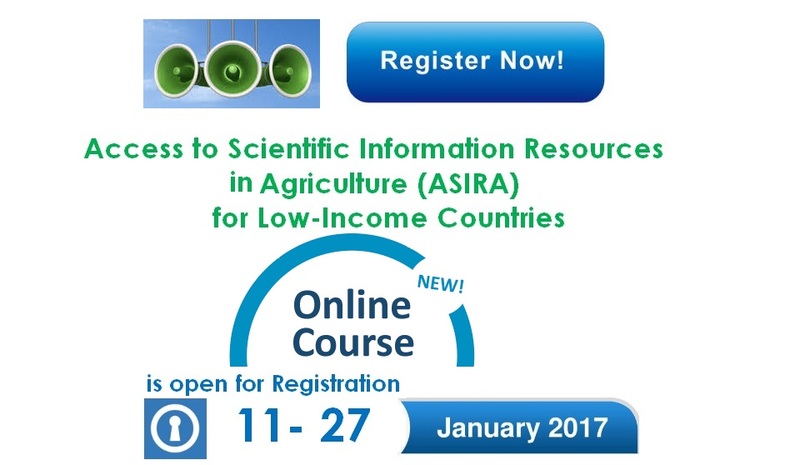 ASIRA online course for low-income countries is delivered by the Food and Agriculture Organization of the United Nations (FAO) in collaboration with Research4Life. The course registration is open from 11th to 27th January, 2017. The goal of this online free course is to provide a platform to enhance the visibility, accessibility and usability of agricultural data and science, particularly in low-income countries. The course is designed to serve the needs of researchers, librarians and students who are operating in agricultural science in becoming familiar with academic publishing landscape, latest trends, and using scholarly information resources efficiently including the legal aspect of the field. ASIRA will be facilitated by experts who will create active participation in the online environment, engage learners, tie the course to the real life practices, act as a guide and provide feedback to the learners. The course will start on February 13th and last for four weeks until March 10th, 2017. Participants will be provided with access to all of the relevant course materials as well as online discussion forums, webinars, videos and additional materials. The course is open to anyone working in agricultural science related institution or studying in agricultural and related sciences can apply for the course. Priority will be given to anyone from Research4Life eligible countries. Group A and Group B respectively. Those who pass the end of course exam successfully will be awarded with a course completion certificate. Applications must be submitted by January 27th 2017. ONLINE submission of the Registration Form is also accepted and no need to resubmit the soft copy to the given email address. If you have any questions or queries, please email us at agora@fao.org.